Re: Post your rigs here. Nice case Biker I really like the red and how it stands out. It reminds me of classmate who has a red and black rig and only will only buy a new part if its in those colors.. I'm not picky at all, I tend to buy purely on spec, and the value for money. I like the cable in the machine to be tidy, but that doesn't cost money, only time! I really like the H440 and the S340 cases from NZXT, the internals are so cool looking with the PSU shroud and the SSD mounts sitting under the GPUs. Sorry guy's I don't own a desktop...I own 2 laptops. Here's my rig. It pulls double duty as the media server for the family as well as my personal rig/gaming machine. Mine is not over fancy. It has a Asus()hp) A8N-LA motherboard that was bought new. Its old and slow but have done a few refinements. Have 4 gigs of cruciel ram. Thats ddr. 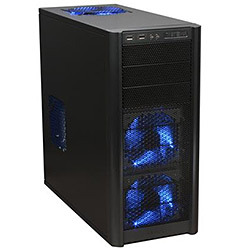 The processor is a AMD Athlon 64X2 4800+ dual-core. I have updated the fans in the cabinet. Have a 90 cc fan for the CPU. 2 chassis fans 120cc. two other 80cc for the chassis and 1 30cc for the ram. running 2 hard drives, one sata and one older one on ide. Have two dvd rewrite burners. A media card reader and now adding a MSI Getforce gt 710 and a new sound card. that pretty much totals out the ststem and the cabinet is a old atx used tower i have had for around 9 years now. I am running Windows Home 64 bit. My next system will have a new tower cabinet as this one is showing its age and if i am going to build a new tower it might as well have a new home to put it in. I know its old but works pretty good for what i need it for. I know i will be slammed for the old unit but I'm old so it fits me. I'm lost. I've gone to look for me. If I should return before I get back, please ask me to wait.